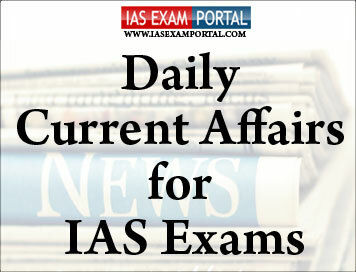 Current Affairs for IAS Exams - 02 FEBRUARY 2019 | IAS EXAM PORTAL - India's Largest Community for UPSC Exam Aspirants. He expressed happiness that it is good to see more people being removed from the shackles of poverty. Our Neo-middle class is rising and so are their dreams. PM congratulated the middle class for the relief in taxes. About the pro-farmer initiatives in the budget, he lamented that for years, many initiatives have been initiated for farmers but sadly, lot of farmers never came under the ambit of these schemes. He said that PM KisanNidhi is a historic step for farmer welfare which will help the farmers who have under 5 acres of land. PM added that the animal husbandry sector, fisheries have been taken care of in the Budget for New India. Underlining the importance of safeguarding the interests of the unorganised sector, he said PM Shram Yogi Man DhanYojana will be of great help. This sector needed more safeguarding of their interests and the Budget for New India. has done so. Ayushman Bharat Yojana and social security schemes are also going to touch their lives, PM added. Chief Election Commissioner Sunil Arora has ruled out going back to the ballot paper. Interacting with the media yesterday after two days of deliberations with political parties and officials in Kolkata over the upcoming general election, Mr Arora said that the Commission is not going back to the days of ballot paper. He said Electronic Voting Machines (EVMs) have been in use in our country for more than two decades. Mr Arora said it has been a consistent policy of the Election Commission of India for quite sometime and he thinks it will remain the same. He said political parties have a right to make their feedback known and their apprehensions because they're the biggest stakeholders after the voters. On political parties request to deploy special general and police observers in the state, Mr Arora said the Commission has taken stock of all the feedback and they will be looked into. The CEC said strict action would be initiated against officers on election duty if they are found guilty of having "malafide" intentions while executing their duties. Election Commissioner Ashok Lavasa, as well as deputy election commissioners UmeshSinha, SandipSaxena, Sudip Jain and Chandrabushan Kumar were also present during the interaction. The Government proposes to launch a mega pension yojana namely 'PradhanMantriShram-Yogi Maandhan' for the unorganised sector workers with monthly income uptoRs. 15,000. While presenting the Interim Budget 2019-20 in Parliament today, the Union Minister for Finance, Corporate Affairs, Railways and Coal, ShriPiyushGoyal said that half of India’s GDP comes from the sweat and toil of 42 crore workers in the unorganised sector.The Government must provide them comprehensive social security coverage for their old age. Therefore, in addition to the health coverage provided under ‘Ayushman Bharat’ and life & disability coverage provided under ‘PradhanMantriJeevanJyotiBimaYojana’ and ‘PradhanMantriSurakshaBimaYojana’, our Government proposes to launch a mega pension yojana namely 'PradhanMantriShram-Yogi Maandhan' for the unorganised sector workers with monthly income uptoRs. 15,000. ShriGoyal said that this pension yojana shall provide them an assured monthly pension of Rs. 3,000 from the age of 60 years on a monthly contribution of a small affordable amount during their working age. An unorganised sector worker joining pension yojana at the age of 29 years will have to contribute only Rs. 100 per month till the age of 60 years. The Government will deposit equal matching share in the pension account of the worker every month. It is expected that at least 10 crore labourers and workers in the unorganised sector will avail the benefit of 'PradhanMantriShram-Yogi Maandhan' within next five years making it one of the largest pension schemes of the world. A sum of Rs. 500 crore has been allocated for the Scheme. Finance Minister PiyushGoyal said that the government would be missing its fiscal deficit target for 2018-19 and 2019-20, a fact that economists flagged as a matter of concern. “The estimate of incomes and expenditure, which I am presenting today, pegs the fiscal deficit of year 2019-20 at 3.4% of GDP,” Mr.Goyal said in his Interim Budget speech. Terming the Interim Budget as an exercise that ‘prioritised populism over fiscal prudence’, Angel Broking said the fiscal slippage could have an impact on the Reserve Bank of India’s decisions on interest rates. “There are two things playing out for the banking sector from the Union Budget,” JaikishanParmar, senior equity research analyst – BFSI, Angel Broking said. “On the one hand, the higher fiscal deficit target set at 3.4% for 2018-19 and at 3.4% for 2019-20 will mean that the RBI may not be too keen to cut rates in the immediate future,” he said. Economists also expressed concern over the disinvestment target being retained at ₹80,000 crore for 2018-19 and increased to ₹90,000 crore for 2019-20. So far, the government had raised about ₹36,000 crore. The actual deficit numbers will depend on the realised GST collections over the next two months and the government’s ability to meet disinvestment target over a time line of one month left for action before election code kicks in. The U.S is suspending its obligations under the Intermediate-Range Nuclear Forces (INF) Treaty effective February 2 and will withdraw from the treaty in six months, Secretary of State Mike Pompeo said at a press briefing that lasted less for about eight minutes. The treaty, signed during the Cold War in 1987, bans ground-launched missiles with a range of 500 km-5,500 km. It was key to ending the arms race between the (then) two superpowers and helped protect the U.S.’s NATO allies in Europe from Soviet missile attacks. “We cannot be the only country in the world unilaterally bound by this treaty, or any other,” President Donald Trump said in a statement issued by the White House on Friday. However, the Secretary left open the possibility that the treaty could be rescued in the six-month withdrawal period. “If Russia does not return to full and verifiable compliance with the treaty within this six-month period by verifiably destroying its INF-violating missiles, missile launchers and associated equipment, the treaty will terminate,” he added. The U.S. has also been concerned that China has been gaining a strategic advantage over it as it is not party to the treaty and bound by its terms. Withdrawal from the treaty will increase the weapons options for the U.S. in the Pacific, where China has increased its influence. In the evolving case of the University of Farmington sting operation that The Hindu has been closely monitoring, 129 of the 130 arrested “students” are Indian nationals, Immigration and Customs Enforcement (ICE) said in an email. One of them is Palestinian, Voice of America quoted official sources as saying. Three indictments, unsealed on Wednesday in the U.S. District Court of the Eastern District of Michigan in Detroit, charged eight individuals of Indian origin with recruiting students to keep their immigration status in the U.S. valid and provide them with work permits by abusing the F-1 student visa scheme and associated curricular practical training (CPT) opportunities. One of the key drivers of the world’s climate is an area in the North Atlantic Ocean, where warmer and colder water mix and swirl. When scientists went for their first close look at this critical underwater dynamo, they found they were looking in the wrong place. By hundreds of miles. The consequences are not quite yet understood, but eventually it could change forecasts of one of the worst-case global warming scenarios still considered unlikely this century, in which the mixing stops and climate chaos ensues. It’s called the Atlantic Meridional Overturning Circulation, and scientists describe it as a giant ocean conveyor belt that moves water from Greenland south to beyond the tip of Africaand into the Indian Ocean. But then a new international science team measured temperature, saltiness and the speed of ocean currents throughout the North Atlantic to try to better understand the conveyor belt. Ms. Lozier and several outside experts said this doesn’t change their trust in the models, especially because when the models are checked with what is happening in the real world, they are found to be generally accurate. Mithali made her ODI debut way back in 1999 and has featured in 200 games out of the 263 ODIs India have played.She has also played 10 Tests and 85 T20s.